I have made scratch stock in the past, but Garrett Hack taught me how to make a much simpler housing and the correct way to sharpen the blade. 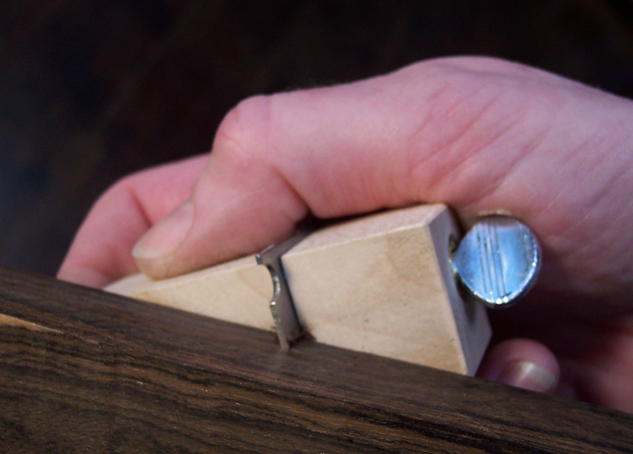 The blade is a piece of old band saw blade and the chunk of wood that houses it has a sawn kerf in which the blade fits and a thumbscrew/threaded insert that secures it in place. Sometimes the easiest solutions are the best. In Garrett's class, I had one of those "Aha!" moments when he explained the correct way to sharpen the blade. Once you file your profile (the one shown has a 1/4" quirk bead and a 1/4" double bead), all edges of the blade including the ends and the shape of the profile need to be sharpened. Once I understood that the edges where the flat sides meet the end of the blade, including the profiles, worked like a little scraper, sharpening was easy. The profile, the ends, and both faces must be perfect 90 degrees and razor sharp. This allows you to cut on both sides of the face. So, you can tilt the scratch stock toward and away from you and cut in both directions. You can see the curls of shavings coming off the blade and the resulting ultra-smooth profile. On sharpening: I filed the profile shapes with round files, and used waterstones and slipstones to hone all edges. Ideally, you want a mirror finish on the faces and edges and profile. With scratch stock, you can make any profile you can dream up and ones that can't be made with a router. This opens up a whole new world of creativity that will make your projects unique. This is crazy cool, but how do you get the nifty pictures? Wyldth1ng, the photos where my right hand is in the picture were shot with my left hand. My camera takes decent photos despite the fact that it's taped together and the lens is cracked due to the number of times I've dropped it. Just found your blog today. 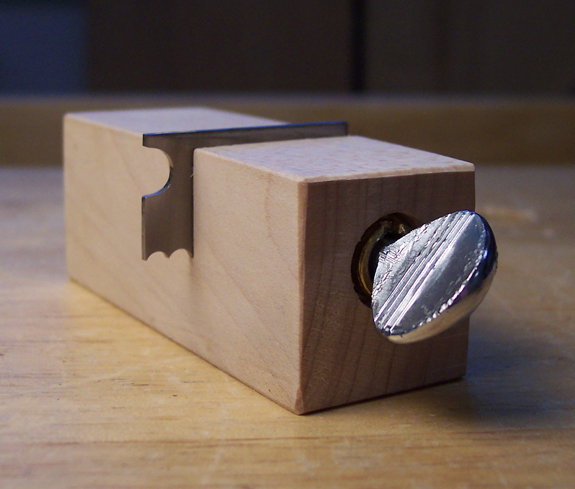 I'm excited to add another good woodworking site to my blog roll. I would love to see the work in progress pictures in larger format. That is some nice work! Hi Rookster, thanks for commenting! I need to finish that piece—it's been sitting like that for half a year—so I'll post some photos when I start working on it again. Hey, Did you want to borrow my jig to hold the camera while you work? Or maybe Rosie can take them for you? Rosie (my dog) with a camera...now THAT'S funny! She doesn't even know who I am; how's she supposed to take photos of me working? That is some fine work in progress. How do you cut the bandsaw blade? I don't suppose a hacksaw will do it. Do you anneal it first? Stephen, I did use a hacksaw to cut the band saw blade and I didn't do anything more to it other than sharpen the profile with files. 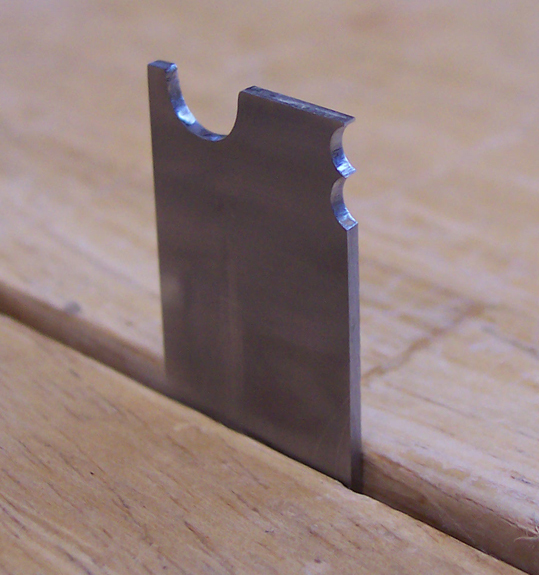 It will hold a sharp edge for quite a while before you need to resharpen, and even then, it's a very quick process. You said that you sharpen it like a scraper...do you burnish it like a scraper too, or is just honing all edges enough? Marco, it works like a scraper, but it's sharpened a little differently than a scraper. You only need to make all of the surfaces 90º to one another and then hone them with stones. You do not burnish them or create a burr. There is no burr, only very sharp edges. Hope that makes sense. I saw Garrett's video on this very shortly before seeing your post. One question - what is the hardware mechanism called that you use to clamp the piece in place? Eric, that is a threaded insert and a thumbscrew. I have been trying to get a blade to work for some time now but it never cuts very well. I am thinking that maybe I am just not making ti sharp enough but on closeups of your blades they look to not be very sharp. Can you give me any suggestions on sharpening? 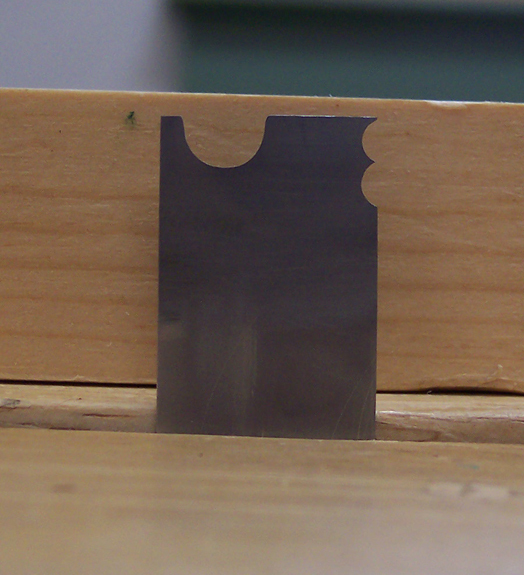 Nathan, I use files to shape the profiles and make sure they are 90º to the flat sides of the scratch stock blank. Then I follow up with slipstones that match the profiles, again maintaining a 90º angle. After that, I hone the flat sides and edges of the blank on ceramic stones. It's akin to honing a scraper. The cutting edges on scratch stock are the corners that are created where the sides and edges meet. Those need to be very sharp, but you must also hone all surfaces. 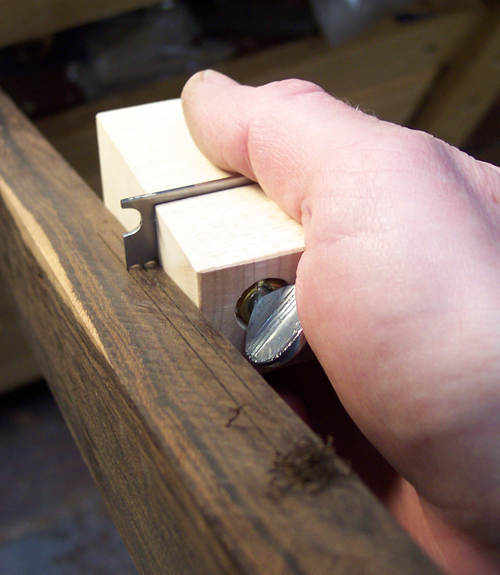 I should add--it's akin to honing a scraper, but you do not create a hook on the edges as you do a scraper. All edges should be 90º.